EEPC has invested continued effort in advising China's forestry policymakers. In comparison, informing energy policy is a nascent front of this Beijing-based EfD centre. In 2016, the National Development and Reform Commission (NDRC) of China and the World Bank commissioned a policy review from EEPC. This policy review is intended to advise policymakers on how to incentivise China's renewable energy sector, in response to the fact that the prevailing governmental subsidies are becoming unaffordable to the exchequer due to the rampant development of renewables. This research project is still in progress but has already delivered influential policy advice in several policy workshops with the NDRC and the World Bank in December 2016. More details are forthcoming in EEPC's policy interaction story of 2016. 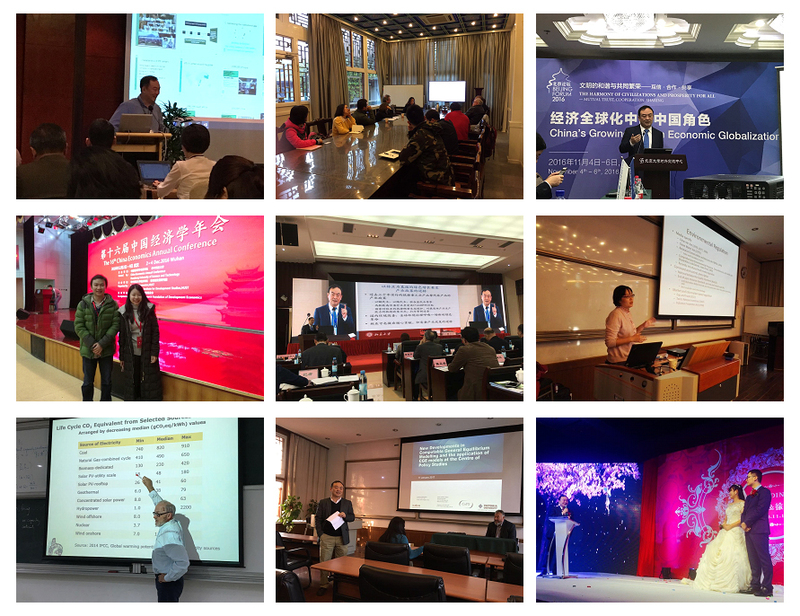 In 2016, EEPC members published 30 research articles in international and Chinese academic journals. Many of these articles were published by high-ranking journals such as the Journal of Public Economics, the Journal of Environmental Economics and Management, the Journal of Economic Psychology, and Climatic Change, etc. During the past few months, EEPC were considerably active at international and local academic events. On 27 October 2016, Prof. Jintao Xu attended the annual conference of the Economy and Environment Programme for Southeast Asia (EEPSEA), a Southeast Asian academic network similar to EfD. He gave a talk on the governance, organisational and administrative structures of EfD in an effort to advise the development of EEPSEA's local centres. On the same day, Dr. Ping Qin hosted a meeting on behalf of EEPC at Peking University with visitors from the Tropical Agricultural Research and Higher Education Centre (CATIE), the host faculty of EfD Central America. The two sides updated each other on recent developments in their administration and research, and explored the possibility of further collaboration. Later on 5 November 2016, Prof. Jintao Xu made an appearance at the Beijing Forum and gave a presentation on implications of traffic congestion for air quality, based on findings from several EfD-funded research projects. This international academic forum dates back to 2004, and has attracted over 4,500 politicians and academics from more than 70 countries to its annual events since then. From 6 – 13 November 2016, EEPC members attended the annual EfD conference and the Ecosystem Service Accounting for Development (ESAfD) workshop in Pucón, Chile. They presented their research proposals and outcomes to a broad audience from all EfD centres. Moreover, EEPC also played an active role in the 16th China Economics Annual Conference held in Wuhan, China from 2 – 4 December 2016. As the Chinese counterpart of the American Economic Association Annual Meeting, this conference assembled over 700 economists from leading universities and research institutions both in China and overseas. Dr. Shuai Chen from EEPC chaired a parallel session on resource and environmental economics, and presented an EfD-funded study on the impact of traffic congestion on air pollution. On 22 December 2016, Prof. Jintao Xu was invited to speak at China's first Planted Forest Management Forum held in Nanning. His speech underlined the vital role of private forestry in China's domestic timber supply, and revealed the institutional hurdles in the way. He further called forth policy remedies to overcome these hurdles. These insights were derived from EEPC's long-standing research series on China's forestry policy. EEPC seminars continued on a weekly basis. These internal seminars offer a formal opportunity for EEPC researchers to present their work and to gather constructive feedback. They are open to EEPC members at all stages, including undergraduate and graduate students, early career and senior researchers. In the Autumn Term 2016, presenters covered a variety of topics, including outcomes of China's forest policy reforms, economics of renewables and unconventional gas, environmental regulations of the US, computable general equilibrium modelling, total-factor productivity of China's provinces, and innovative design features of payment for ecosystem services such as the conservation auction and the agglomeration bonus. 17 November 2016 witnessed the wedding of Ms. Xiaojie Xu, an alumna of EEPC. The ceremony was performed in Dongying, the bride's hometown, which is approximately 400 kilometres south-east of Beijing. All EEPC members were invited, and Prof. Jintao Xu delivered a touching speech at the wedding.